The height of the tide has one of the greatest impacts on how quickly stormwater will drain from the City because most of the outfalls of the City drain to water bodies that are tidally influenced. At high tide, much of the stormwater collection system (the pipes and ditches) is already full of sea water leaving little room for the stormwater runoff. The stormwater that has collected on the surface has no place to go because the pipes and ditches are full and ponding occurs. 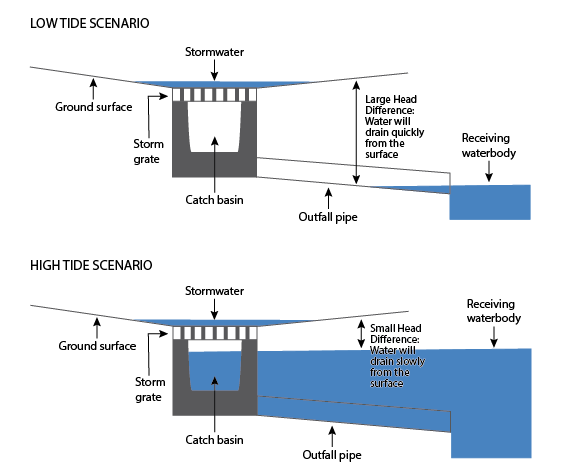 When a high tide stays inland extra long, such as due to wind, the sea water will continue to remain in the outfalls of the stormwater collection system until the tide recedes. Rain events that occur within two hours of high tide will drain significantly slower than rain events that occur during other times. This time frame can be even longer, such as when rain events occur during a higher King Tide and/or when wind forces hold a high tide inland longer. The longer the tide is high and much of the stormwater collection system is full of sea water, the longer time stormwater will pond on the surface with little or no place to go. LEARN MORE about how check valves are successfully preventing sea water from backing up into our stormwater systems. LEARN MORE about how major tunnel and pump drainage improvement projects successfully overcome high tide challenges. LEARN MORE about what causes flooding in the City of Charleston. Important Disclaimer: This web page may provide links to other third-party websites which are not under the control of the City of Charleston. The City of Charleston takes no responsibility for the content in these linked websites and the inclusion of the links does not constitute a recommendation or endorsement by the City of Charleston of the information and views contained therein.